Paper Sweeties Plan Your Life Series - January 2018! Happy New Year! 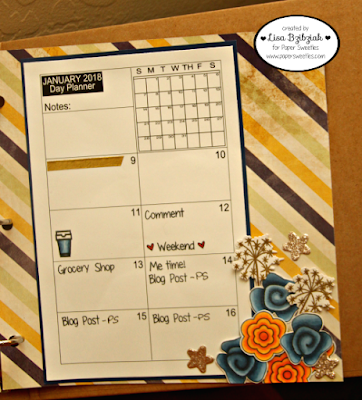 And welcome to the January 2018 Paper Sweeties Plan Your Life Series! 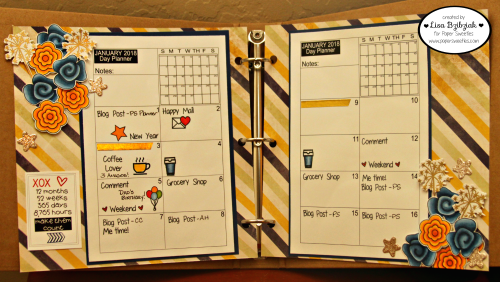 We're changing things up a bit and the Planner Team will be posting on the 1st of the month this year! I've decided to try out a different type of planner this year.. a printable so I can print only the pages I want and here I've decorated and started planning my first two weeks of January! 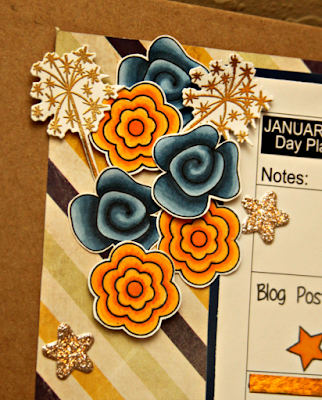 You may or may not know that the Pretty Posies stamps and dies are among my favorites and love to stamp, color and cut them for a little bit of beauty on any type of project! Here I've colored them in yellows and blues to coordinate with the papers I've chosen. I've also used some of my most loved planner sets from Paper Sweeties and all of the links are at the bottom of my post! I printed my calendar on Copic friendly paper so I could color in with my Copics, but you can easily color in on any planner with some colored pencils or water based markers! In celebration of the new year I used the I Love Summer stamps and Sweet Cuts sets for some fireworks (heat embossed in gold and die cut) and stars (diecut from glitter paper) to add into my pretty posy bouquet! So pretty, right? I popped up a few things for dimension, but not too much since I don't want my planner to be too bulky. And I still have some decorating to do on the outside of my planner but I'm deciding for sure first that this is the binder I'm going with... but once I decide for sure, it will be much fun decorating it! And I printed this great sentiment meant to be a possible planner cover, but I pulled it into word and printed it small enough to place in the corner of one of my pages and then used the Get Your Craft on Paper Sweeties Planner Stamp Set to add some fun and color to it! Just love these pretty posies! I'm linking up to the Outlawz Twisted Thursday Anything Goes Challenge with a twist of Anything Goes! Here goes anything! Well, as you can see I'm pretty busy this first couple weeks of January so I better let you get on with your year! Happiest of Days to you today and every day! And be sure to visit all of my teamies to see what they have "planned" for you! 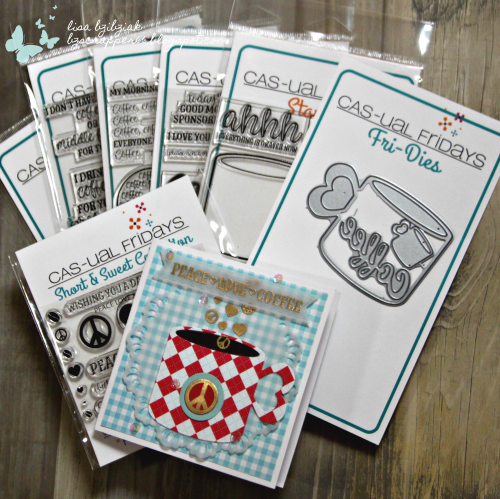 A Thank You To Super Generous Cas-ual Fridays Stamps! I'm linking up to the Outlawz Twisted Thursday Anything Goes with a Twist of Anything Goes! Welcome to this week's Atlantic Hearts Sketch Challenge! 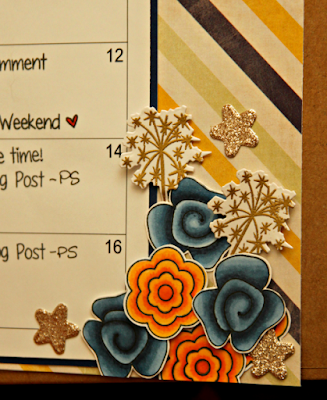 This week, I made a fairly simple card by my standards! 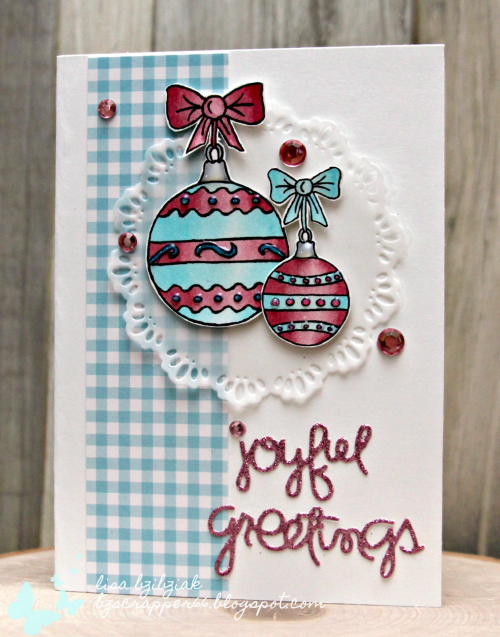 I used some pretty papers from Your Next Stamp... love that gingham that is part of the Winter Plaid paper pad. These cute sketchy ornaments were created by one of the Outlawz DT members, Sandra VanBlaricum. 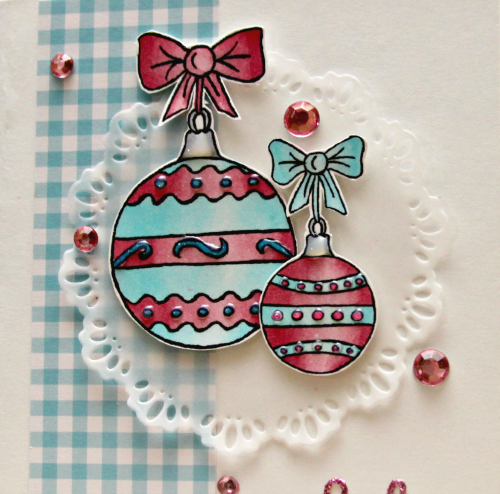 I decided to use some non traditional Christmas colors on this one and kept my color pallet to white, pink and blue. I colored the ornaments using my Copic markers and highlighted with some sparkly gel pens and liquid glass. That pretty doily is from Gina Marie Designs... one of my favorite doily sets. I also took the opportunity to use up some very old CTMH bling I've had forever! Broke the old odd number rule because... well.. it's all I had left! I suppose if I hadn't lost the dot for my J in my sentiment and used one of the gems for that it would have been ok...lol! But it's all right... it doesn't bother me too much! 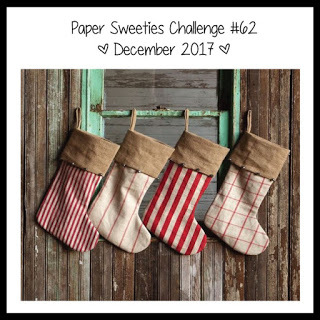 I'm linking up to the Outlawz Progressive/Freebie December Challenge! Very cool... you get a free image to play with each month and as long as you keep creating and linking up with them, you keep getting new ones! You should check it out! It's a Ning site so you have to join, but it's lots of fun! 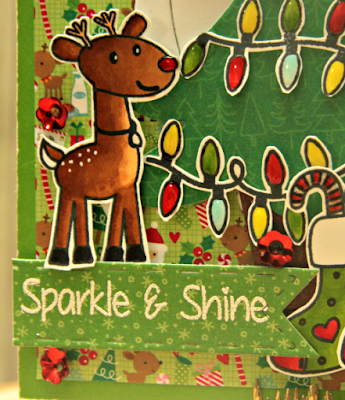 And I thought the font on this pretty diecut sentiment that I cut using a Paper Smooches die and some glitter paper was perfect for these ornaments. I am surprisingly happy with my simple, pretty little card...suppose I better get it out in the mail with the rest of my late cards...lol! 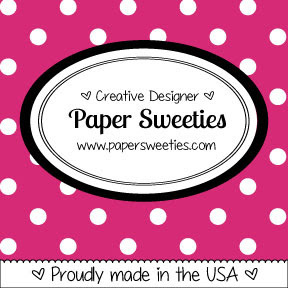 Come back on the 1st for some Paper Sweeties! And don't forget to come on over to Atlantic Hearts and play along! 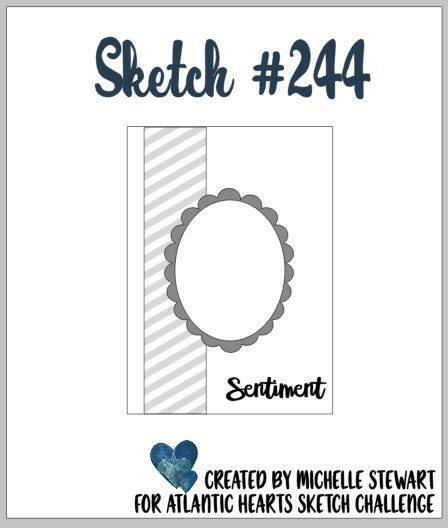 How will you be inspired by the sketch? After trying to figure out how to cut some argyle patterned paper to modge podge onto this wooden tree (I was going to use a snowman and add some argyle paper to his hat, but the tree in the inspiration tag caught my eye and I found this one in my stash), I finally opted to make my own and once again got my Copics out. I started with the red copic and drew diamonds around my tree... figuring I'd do the whole thing and choose the side that looked best to show and this was it...lol! My lines aren't straight and I have some smudges and bleeding, but I LOVE it! it really came together when I added the white dots with the skinny end of an embossing tool I had to pick up small amounts of paint and add the dotted lines. My hands are shaky so this was no small feat and I'm quite happy with how it came out! 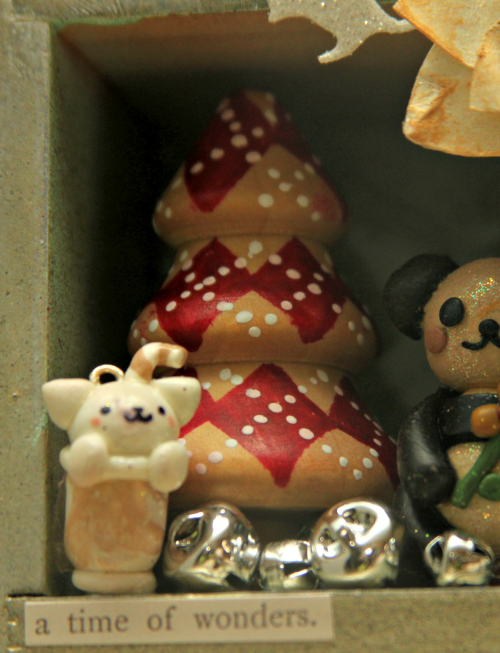 Once I placed the tree, I remembered I had these little clay creations that a girl from work brought in... they were going to be thrown away... rejects... so of course, as most people I work with do... they brought them to me to see if I would want them and of course I did! They were adorable! So they've been sitting in a container and I wasn't sure I was going to remember which one and where, but it was meant to be and they found me and they were perfect! This little guy looks like he's in a stocking. and there is a candy cane behind him! (might be a cup of cocoa or coffee with a straw, but now it's a stocking and candy cane!). And I chose silver bells because of the silver snowflake in the inspiration tag. I'm also linking this cubby up to the Outlawz Twisted Thursday which is Always Anything Goes with an Optional Twist and this week the twist is Anything Goes! I'll take that challenge! So there you have it! My final "Tag"! I have a few empty cubbies left to fill before I share the entire piece with you and I'm hoping to have that ready for you over this long weekend. So please do come back and check up on me! There will be a few things going on here over the next week and soon I'll have some exciting news for you! 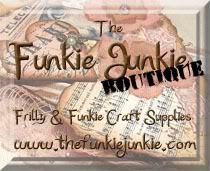 In the meantime, the Funkie Junkie Boutique has an awesome sale going on! It's progressive... the discount gets bigger each day, but the choices are fewer and fewer... are you a gambling soul? Check it out here! And Mitra finished her final project some time ago .. you should check it out here and also see the whole bunch of her "Tags" in one place! 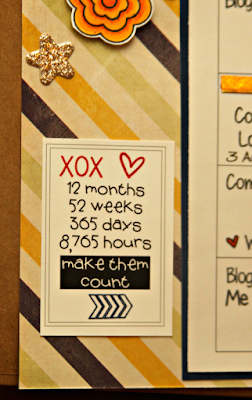 I have one more visit on the Paper Smooches blog this month! 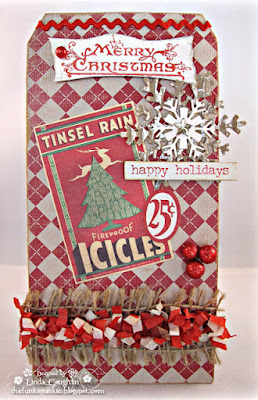 My project for today uses some of the new dies along with some of my old fave stamps and dies! 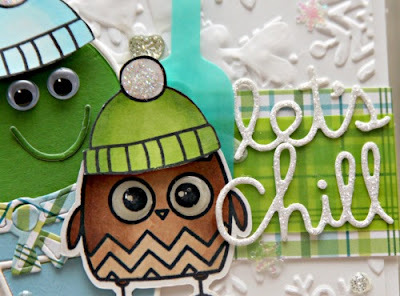 I'm playing along with the Simon Says Stamp Party! Monday Challenge. Just love that cutie pie Cactus Die! 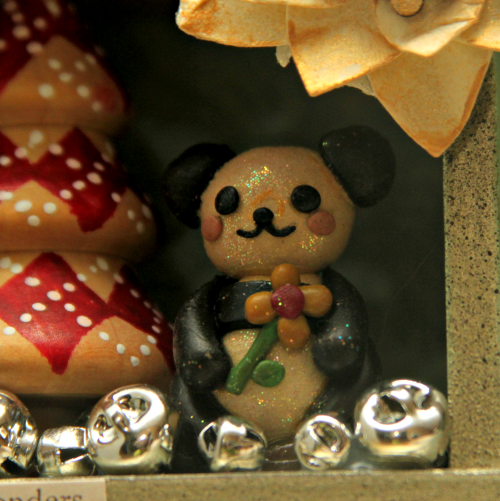 He's so cute and so easy to cute him out of a few colors of paper and piece him together! And the owl from the Spookalicious stamp set... so adorable, right? I stamped him and cut him out. I added a scarf using the Snowman 2 Dies and stamped, colored and cut out the hats from the Cool Dudes stamp set. And they are certainly ready to party with that chilled bottle of wine and pretty wineglass that I cut from vellum using the Wine Dies from this month's release. And I got some inspiration from my Coffee Lover's teamie, Laurel Seabrook, and cut that pretty snowflake out of vellum using the Lovely Snowflake die. And finished it off with an invite to Chill using the new Let's Chill Die! 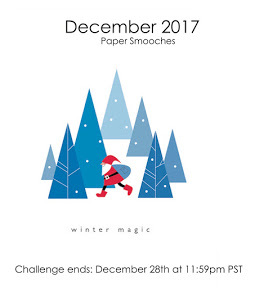 Don't forget to play along with the Paper Smooches Challenge for December! 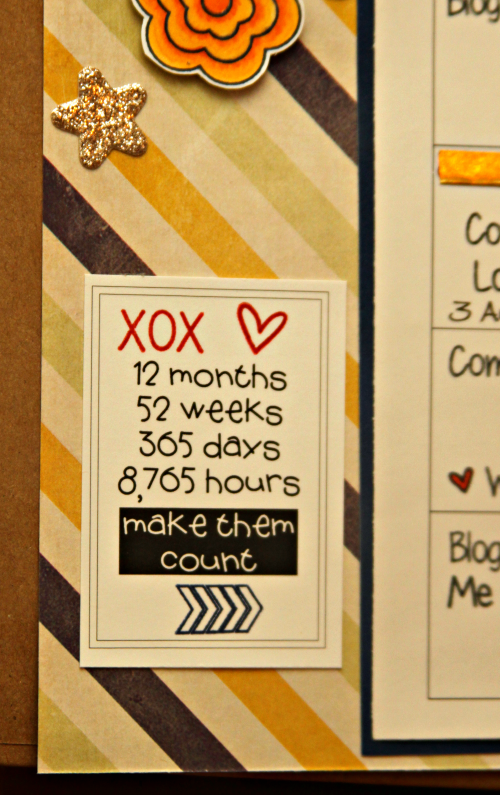 You still have until tomorrow, December 28th to link up here! So you may know that my friend Mitra is the one who "made me" play along with this challenge this year. I use the term "made me" loosely because this has been so much fun and I'm very excited with how my project is coming along. If you aren't familiar, Linda over at the Funkie Junkie creates 12 Tags and over the course of 12 weeks they are revealed and taking inspiration from them, if you create 12 "tags" (which don't have to be actual tags), then you have a chance to win some awesome prizes and also earn a special discount in the Funkie Junkie Boutique! 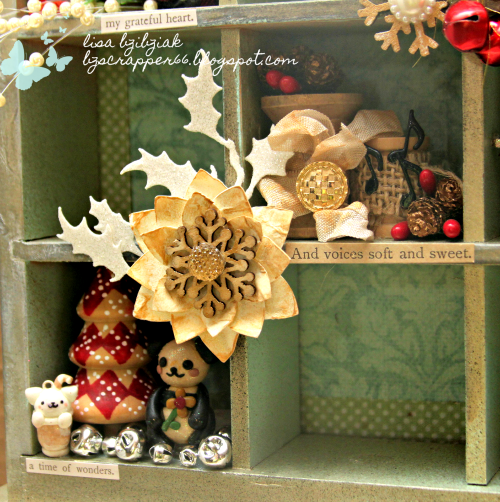 You can find Linda's first post here with all of the details! So for this one, I found inspiration not just from Linda's tag.. the plaid... the numbers... the textured burlap, but also from Mitra's "tag" (aka jar... she's made jars and you should check them all out, but here's the one that inspired me for this one) I was inspired by her plaid fabric rose and I knew I had this plaid ribbon in my stash, so I made one too! She also added some burlap to hers and see those pretty holly leaves and pearls... Mitra sent me those last Christmas in a cute little package of crafty items so I thought they were perfect for this cubby! So one more cubby to finish the challenge and then I'm just filling in some empty spaces! You still have time really... you should give it a try! You have until the 29th to finish all of your "tags"! 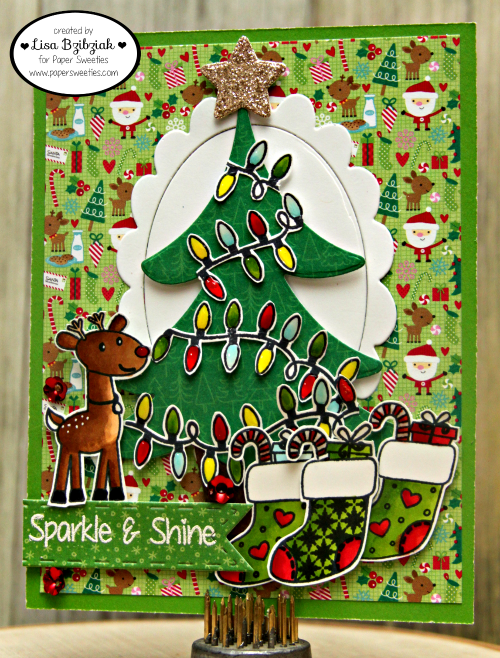 I'm playing along with the Color My Heart Color dare Traditional Christmas Linky Challenge! You should check that one out too! Thanks for stopping and I'll be back to all my shenanigans soon! Don't be a stranger! 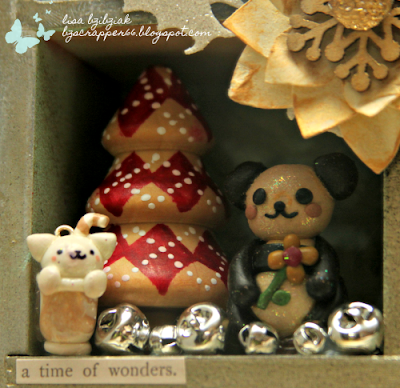 Welcome back for another day of Christmas inspiration! 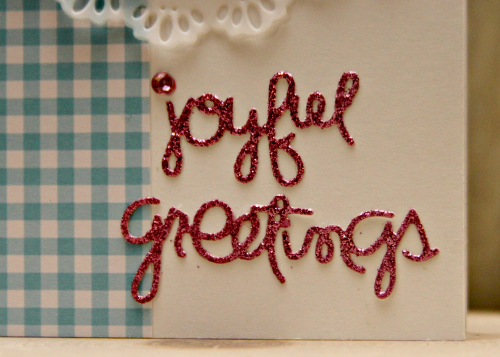 Today I'm sharing another Christmas card... I wonder what the chances are that I've mailed this out already...lol... probably not very good! I started with the Oval Scalloped Frames as a backdrop for the diecut tree from the Merry & Bright Sweet Cuts. 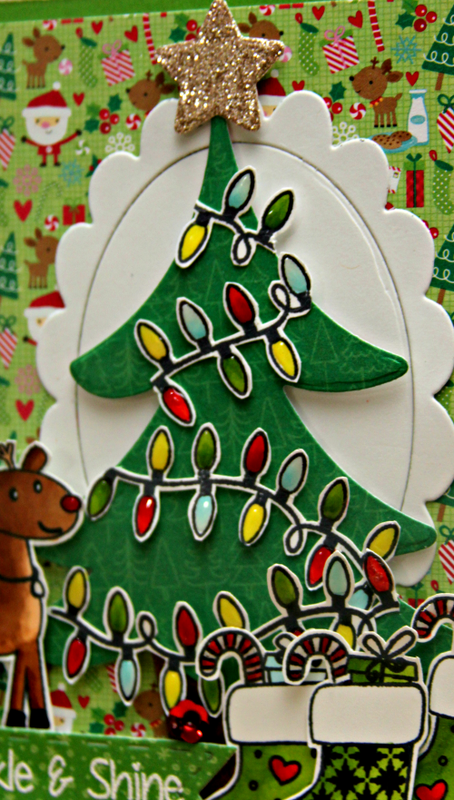 I stamped and cut out two sets of lights from the Baked With Love set. I colored them with my copics and then added liquid glass for dimension and shine. Just love this adorable reindeer from the Jingle All The Way set! He's in charge of quality control... making sure everything looks just right before taking off to the next house. 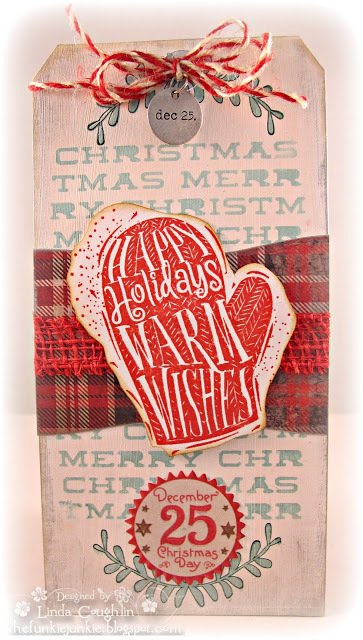 And this pretty sentiment from Merry & Bright stamped and embossed in white onto a banner from the Sweet Borders Sweet Cuts. 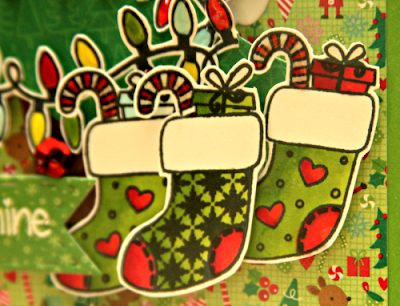 And these stockings from the Dear Santa stamp set are so adorable... a few different patterns to mix and match! That's it for me for today! 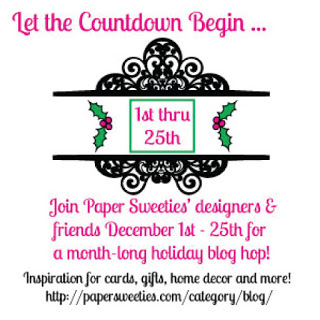 I hope you've enjoyed the Paper Sweeties month of Inspiration! There is one more post on the Paper Sweeties Blog tomorrow! Merry Christmas if you celebrate it and Love and Peace to all! You still have time to play along with this! For a chance to win this! And! Here's the whole schedule for this month! And if you're just getting started take a few minutes and check out what everyone has made! 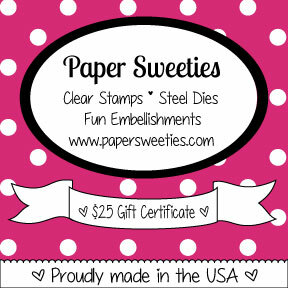 Paper Smooches - Let's Giggle! Coffee Lovers Blog Hop-Day 8 Can't Let Go! 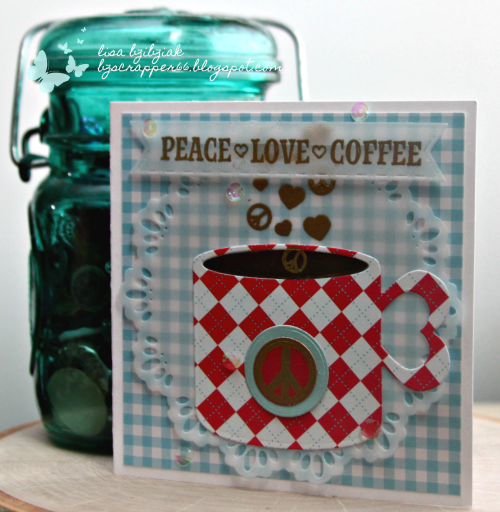 Coffee Lovers Blog Hop - Day 7?? Coffee Lovers Blog Hop-Day 6 National Cocoa Day! 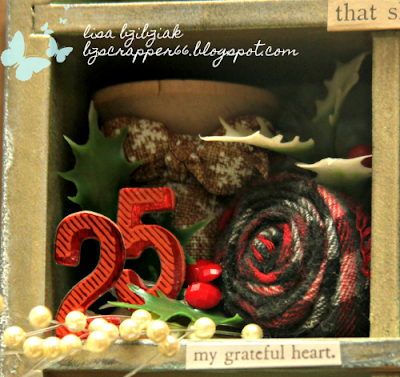 Coffee Lovers BlogHop-Day 5 With Paper Smooches! 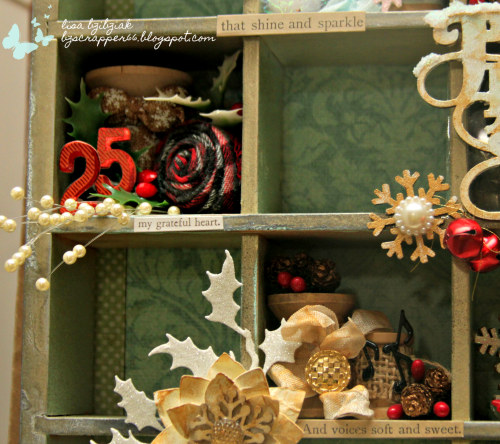 Cutting Cafe Inspiration-All About Christmas! 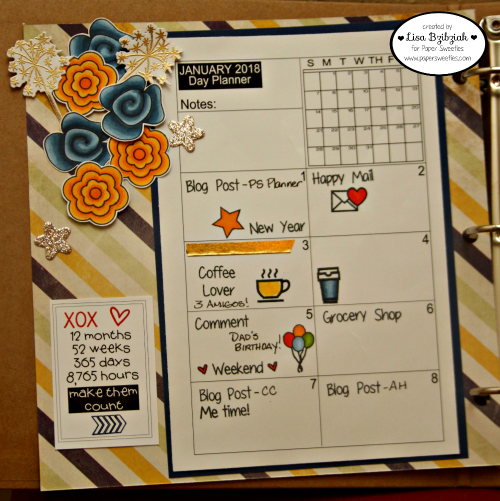 Caffeine Fueled Paper Play with Your Next Stamp! 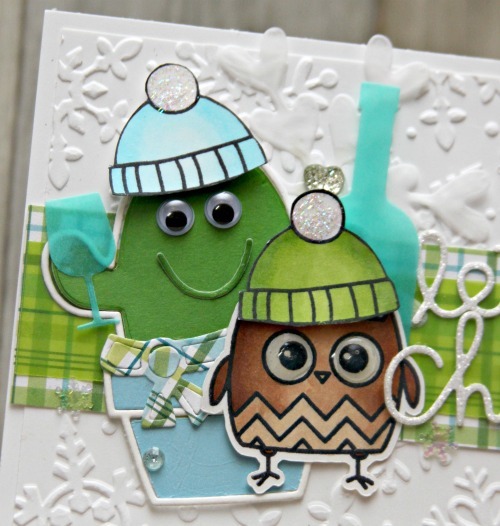 Three Amigos Blog Hop Challenge-Silver & Gold!